On Sunday July 1st, the Environmental Performance Agency, in collaboration with Dan Phiffer, launched a new iteration of OnBehalfof.Life! This time we’re focused on gathering public comments in response to Scott Pruitt’s proposed “transparency” rule. You can participate online at OnBehalfof.Life or visit our gallery installation in the Bronx at Wave Hill’s exhibition Ecological Consciousness: Artist as Instigator. On the evening of August 1st we’ll host a workshop for those interested in submitting comments together on site at Wave Hill! This weekend EPA agents Catherine Grau, andrea haenggi and Christopher Kennedy led a performative field study exploring the agency of spontaneous urban plants (aka weeds) found on Swale and the surrounding borderlands of the Brooklyn Army Terminal. We discovered an rhizomatic network of knotweed breaking up the recently paved asphalt, aquatic weeds growing on the hull of the barge, a multispecies food forest, and feral shorelines among other things. 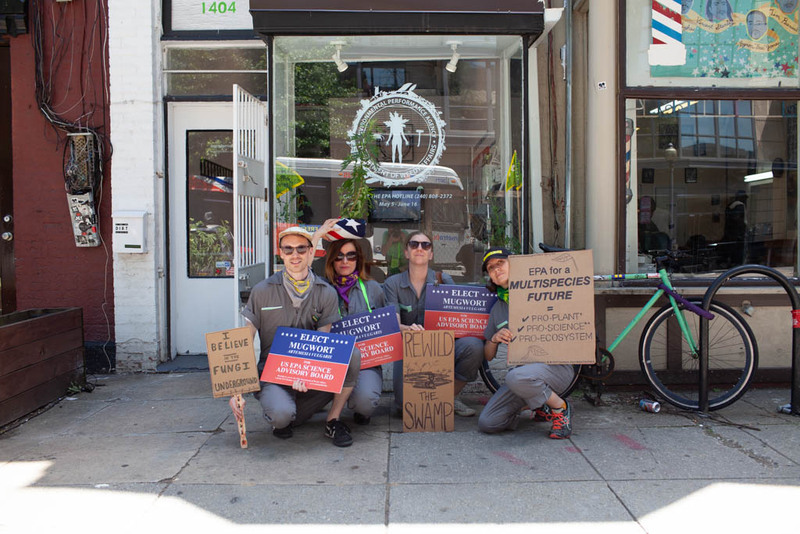 The EPA’s exhibition at Transformer in Washington DC was recently featured in a Vice Article by Claire Voon. To read the full article click here. 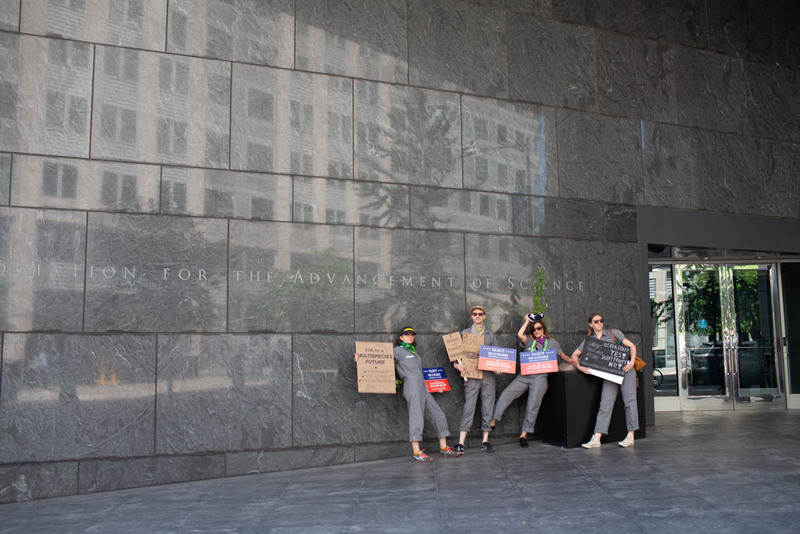 June 15, 2018: A day of embodied actions at the US EPA to celebrate the nomination of Artemisia vulgaris for the Science Advisory Board. WASHINGTON, D.C. – The Environmental Performance Agency’s Department of Weedy Affairs (DWA) announces the nomination of Mugwort (Artemisia vulgaris) for the US EPA Science Advisory Board. 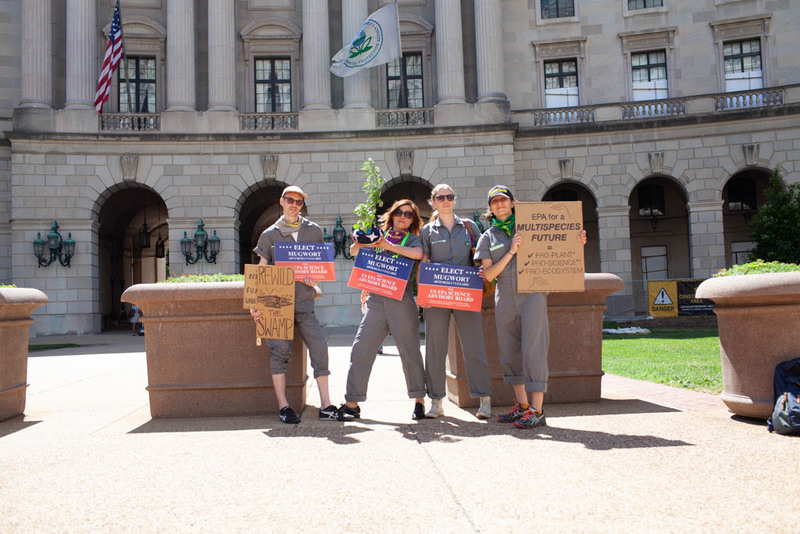 “Mugwort has a proven record for fighting and not giving up and will go deep to find new territories and new perspectives for the challenges facing the US EPA right now,” says EPA Agent Andrea Haenggi. We invite you to join us at 2pm on June 15th at Transformer for a ‘meet the candidate walk’ and kick off event. 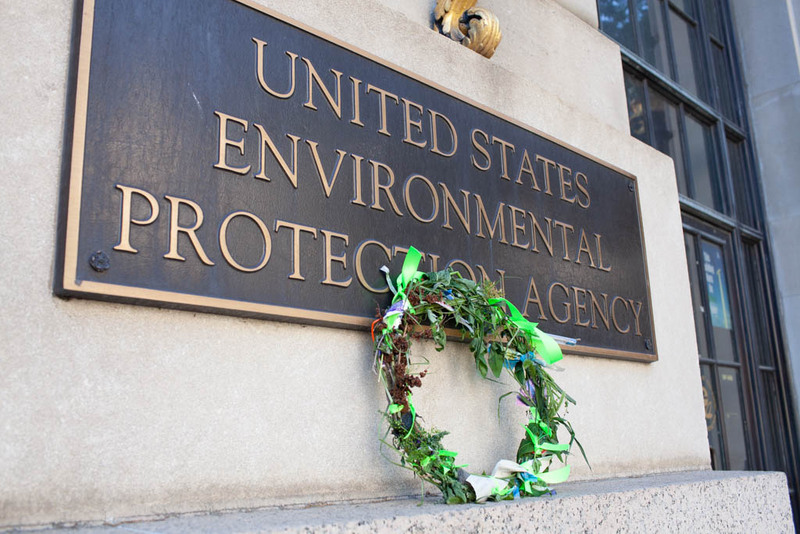 The event will include public readings of comments collected at the DWA office, embodied actions, and a public address at 3PM at the US EPA Headquarters in Washington DC. 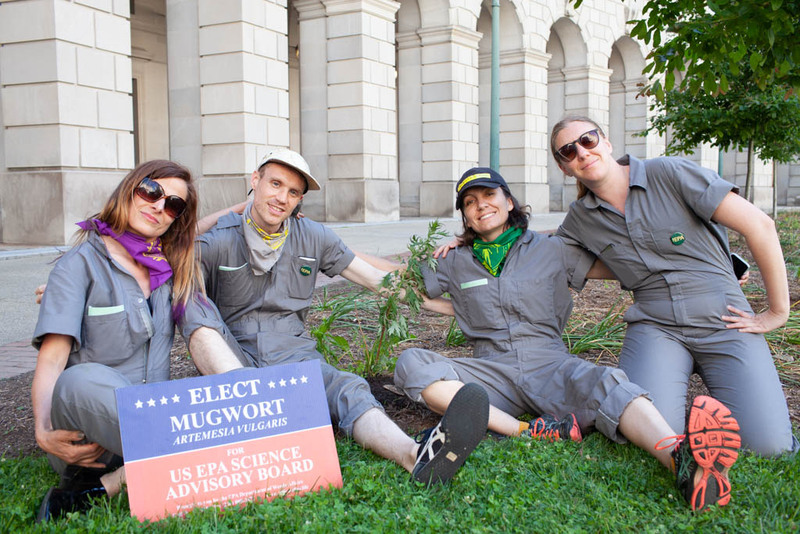 As the DWA’s resident Rhizome Biologist, Mugwort’s platform is multi-pronged and multi-species, using its root system to address a range of regulatory rollbacks including Scott Pruitt’s recently proposed rule “Strengthening Transparency in Regulatory Science.” Despite the deceptively benign title, this new rule will prevent vital forms of public research from being carried out by US EPA officials, weaken the role of science in the development of environmental policy, and open the door for corporate and private interests to conduct misleading research with severe consequences for human and more than human health. Mugwort invites you to stand in solidarity on behalf of all life to imagine a world beyond human. 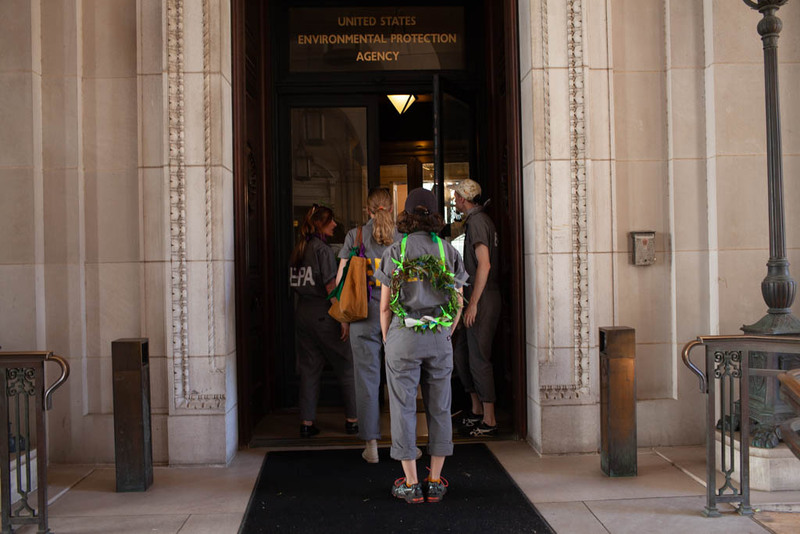 Come meet the candidate and join the entire EPA team for an afternoon of embodied action, reflection and a public show of gratitude to current US EPA employees. 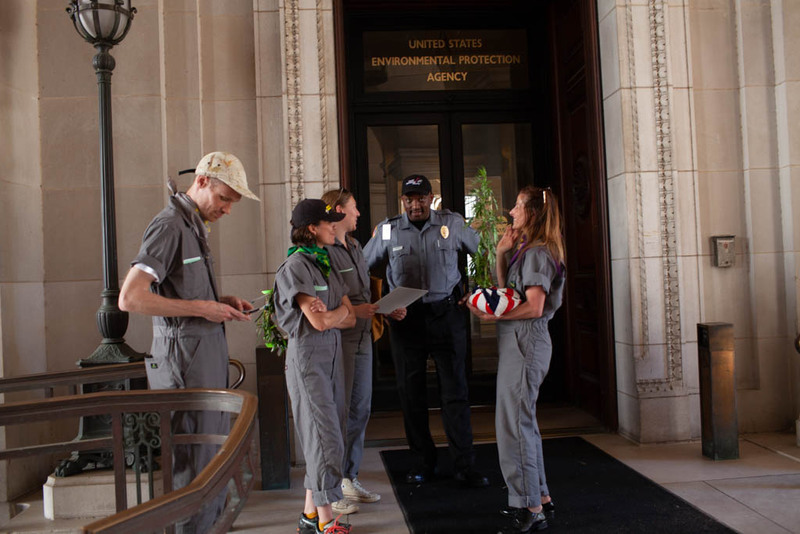 This weekend EPA agents Ellie Irons and Chris Kennedy (with indigenous activist Sebi Medina-Tayac) led a Weedy Resistance Walking Tour of the National Mall. 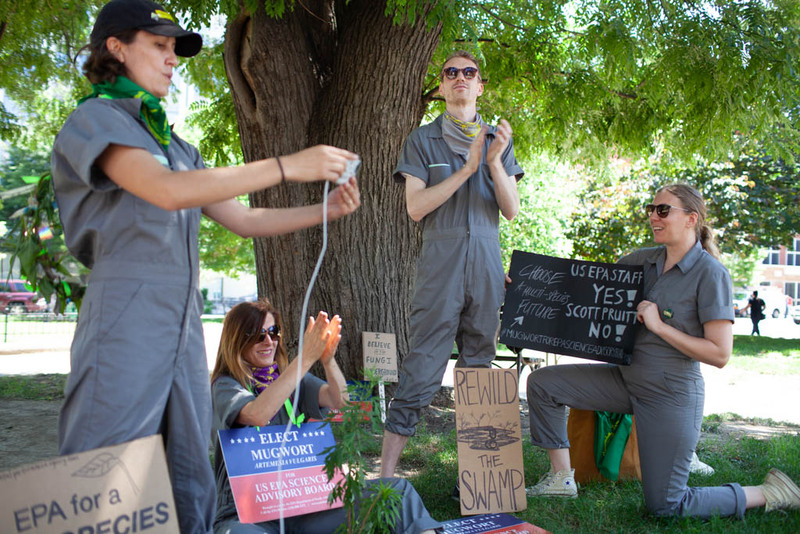 They led participants through a series of embodied actions, observations and discussions on the complexities of land management practices, colonial occupation, and the possibility of spontaneous urban plants to inspire new forms of political and cultural organizing in the so-called Anthropocene age. and the rejection of the Bureau of Land Management’s public land use planning process, among many others. As the Chief Safety Officer I assure you that our staff at the DWA, made up of the most resilient of your kingdom Plantae, can handle these threatening environmental conditions. We’ve been evolving to endure the excesses of post-industrial Capitalism for generations. However, the other nonhuman species with whom we share this world will not be able to cope so easily, and place human well-being in further danger. In response, the Department of Weedy Affairs has activated the web platform OnBehalfOf.Life to encourage our human allies to submit public comments to the US EPA on behalf of another species. We urge you to raise your voice and call or text the Environmental Performance Agency’s hotline (240) 808-2372 and leave a message for Scott Pruitt and US EPA officials on behalf of a species who can’t. 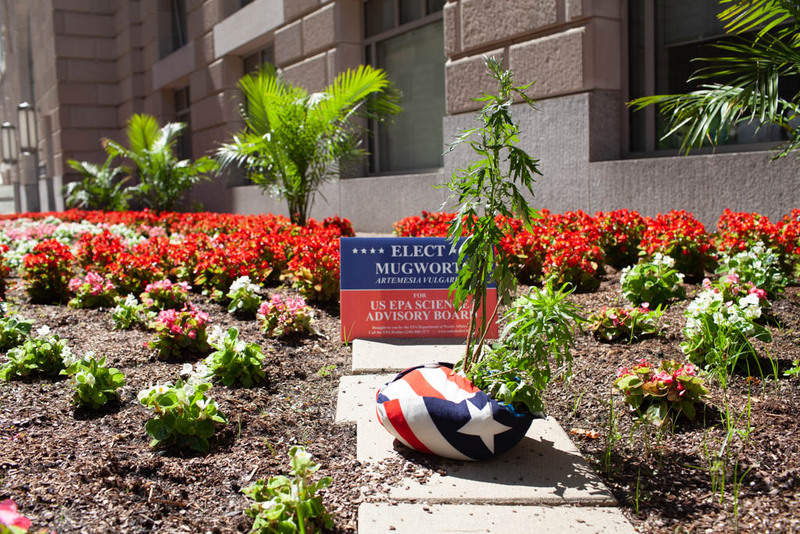 Thanks to the Washington City Paper for featuring the EPA’s latest project The Department of Weedy Affairs. 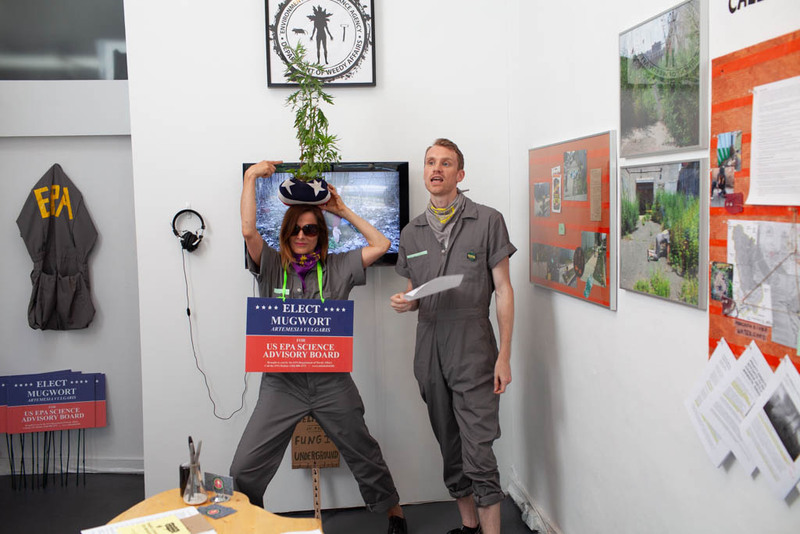 At Transformer, a Solid Artistic Argument That We Should Replace EPA Leaders With Actual Weeds, by Kriston Capps. Washington City Paper (May 24, 2018). 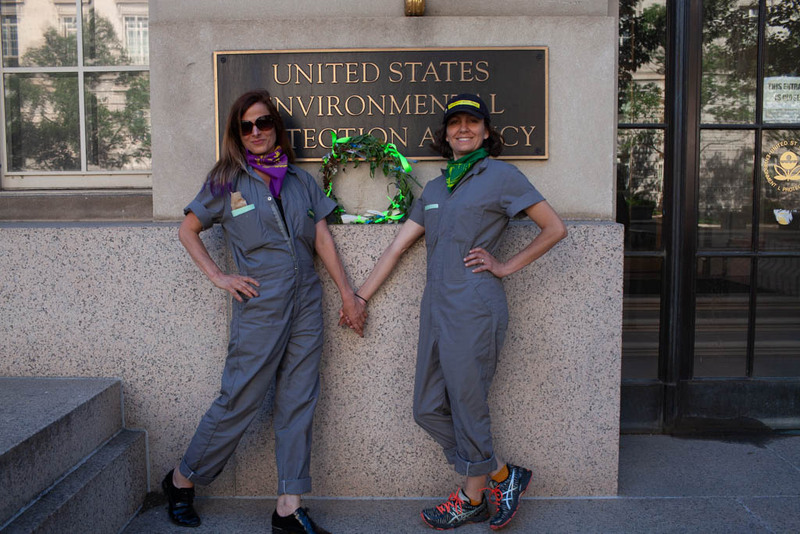 EPA Agents Catherine Grau and andrea haenggi were in Washington DC this past weekend, working with members of the Department of Weedy Affairs staff on a workshop called Crack the Patriarchy. Together with the weeds, workshop participants explored the question: How can we articulate, ally with, and reclaim the more-than-binary ways of being that are cracking the patriarchy? This weekend, EPA presented at Open Engagement at the Queens Museum and Hall of Science in New York. We led an interactive workshop called Plant Talk Human Talk exploring the lawn outside the Hall of Science in Corona-Flushing Meadows Park. Plant Talk Human Talk explores the biocultural possibility of spontaneous urban plants (aka weeds) as collaborators and guides in imagining new urban systems/ecologies. The Queens Museum’s surrounding landscape serves as a site for applied fieldwork where participants will engage in EPA’s embodied scientist training for cultivating plant-human relations and interspecies alliances. Tactics include wild plant unmapping, radical care sitting, and creating embodied scores for a world beyond human.